Most weekdays I’ll have a light lunch like a salad or some hummus and pita chips. And now that my two sons are practicing that vegetarian life, I’ve had to get a little creative in the kitchen for dinner time. The same ‘ol salads can get really boring after awhile, but if you have a few tricks in your kitchen arsenal, you can whip up one flavorful and dare I say…exciting salad. I was recently introduced to two companies that have helped make dinnertime a little easier: RawSpiceBar and Veetee rice. I’ll tell you more about both in a minute, but first have a look at this gorgeous salad. 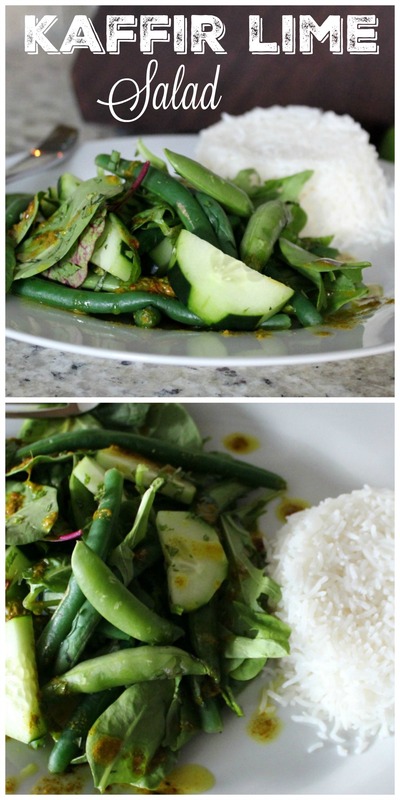 This salad was such a hit, that my 16 year old son took it with him for lunch today. I love it when I have a winner like that! 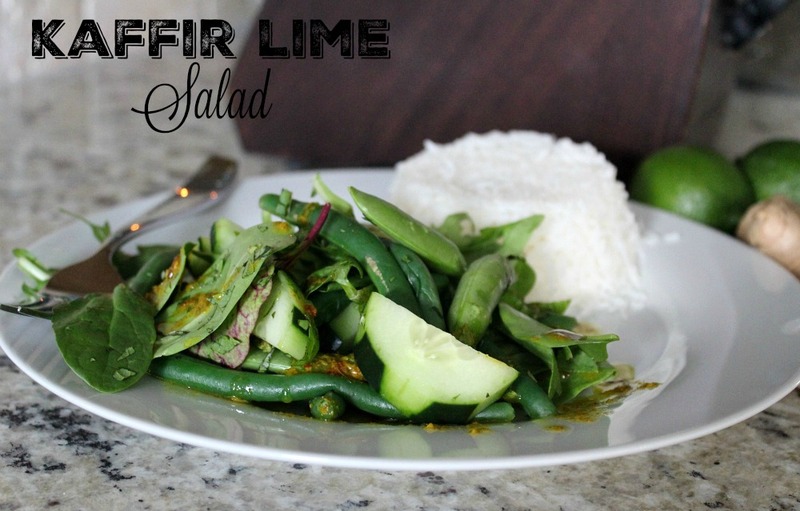 The Kaffir Lime Salad is a recipe that came in the October RawSpiceBar subscription box. 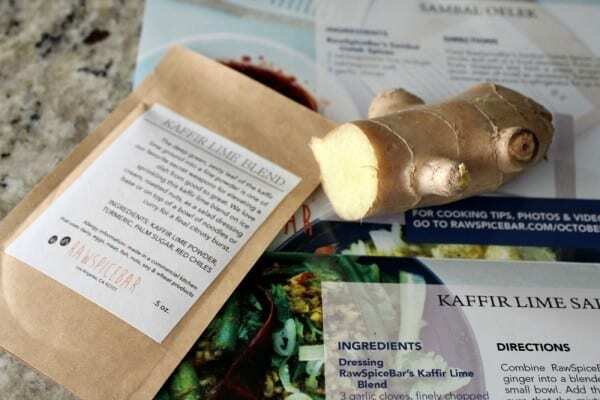 Once a month, small batch, freshly ground spice blends are delivered to your door for only $6 a month. They’ve collaborated with some of the top chefs to create 3-4 spice blends that come from a different region each month. October is The Malaysian Spice Box. Not only am I receiving spice blends that are new to me, but recipes as well. 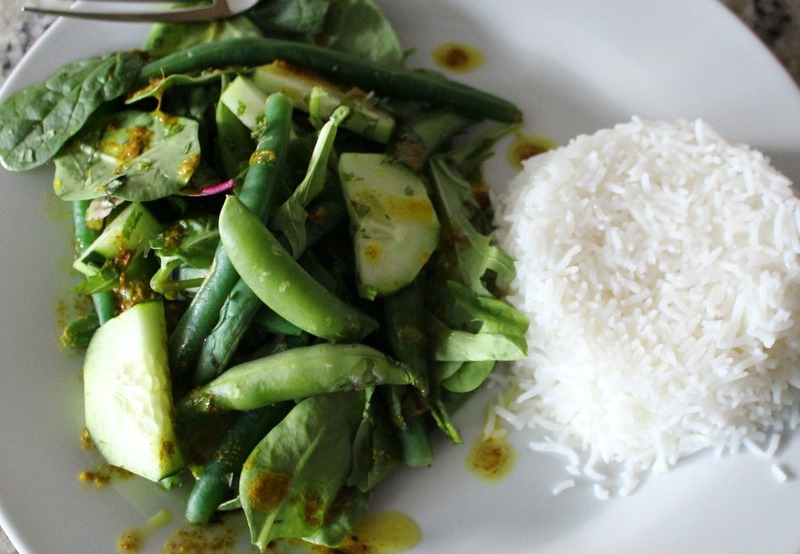 These recipes are easy and fun, allowing you to try different flavors from around the world. My sons and husband loved this salad and loved the fact that they were trying something new. 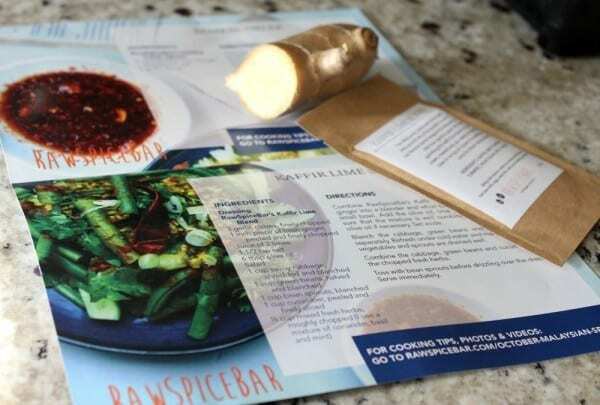 RawSpiceBar is a fun way to introduce new cultures and flavors to the family. I was able to adapt the recipe to what we had available in our kitchen. I started with a base of power greens that included kale, spinach and a number of other greens. I added green beans and cucumbers (which the recipe called for) and snap peas. The dressing was really easy to make and the aroma coming out of my kitchen made me feel like a 5 star chef. The dressing was made using their Kaffir Lime spice mix, fresh garlic, ginger, olive oil, fresh lime juice and salt. I whipped it up in our blender, which made the process go very fast. I wanted a little something extra to go with our salad and decided rice would be the perfect partner. I absolutely love rice. All kinds of rice, but cooking it isn’t always my favorite. Between the mess I seem to make with it boiling over or deciding at the last minute to serve rice along with our meal and having to wait 20 minutes, an easier alternative was welcomed with open arms. I was recently introduced to Veetee rice and am officially a fan. Veetee is very popular in the UK and has just recently been introduced here in the US. 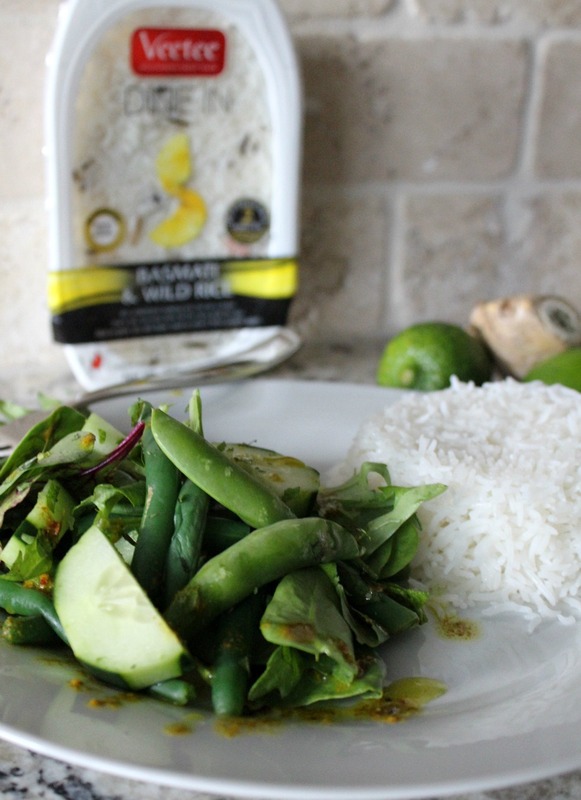 It comes in 8 varieties: Wholegrain Brown, Long Grain, Basmati & Wild, Thai Jasmine, Golden Vegetable, Basmati, Chicken Flavor, Thai Lime & Herb. It take two minutes, by warming it up in the microwave, and it’s ready to eat. Not only was I impressed with the convenience, but the quality of the taste and texture as well. They are able to create this quality with special technology exclusive to Veetee. It’s sold at HEB stores for us Texans, and several others which you can see here. Speaking of HEB, I paired this meal for my husband and I with a new wine I picked up last week. 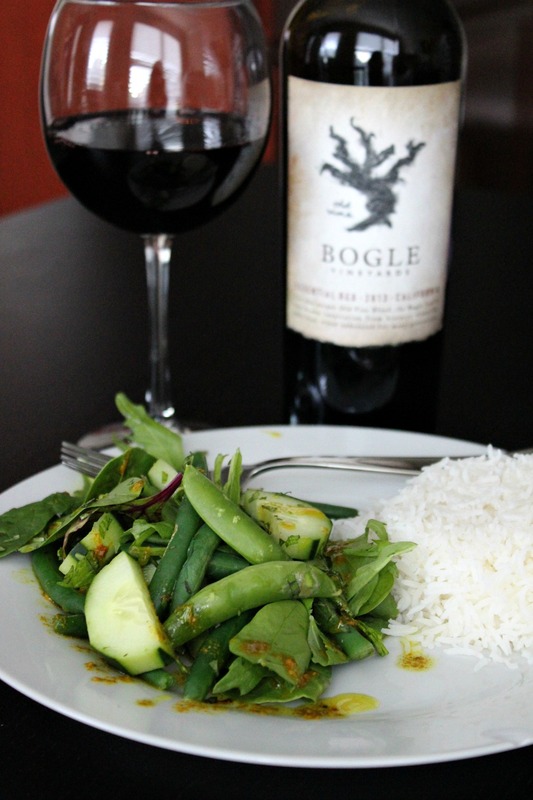 It’s called Bogle and is a California wine that is bold and smooth. It was the perfect pairing. To sign up for a RawSpiceBar subscription, visit their website. To find out more about Veetee rice, go here.